This page is under development. It is intended to be used to provide live images and instant message communications from the site of the current observing or imaging location. This will be done by a Telstra NextG connection back to this web site. The location is normally Golden Grove on a Friday Night each side of the New Moon, weather permitting. If this page is ACTIVE, you can click on the IRC link below to talk to us on site. Location: Golden Grove Note: In the Nickname box, enter a Nickname of your choosing that is free on the system. You do not need to configure a account for the IRC session to work. 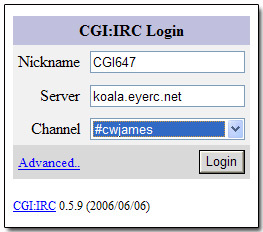 All that remains, is to use the drop down menu on the Channel and select the #cwjames channel as shown opposite. Look forward to talking with you.